On any given day in Miami, the sun and rain beat down on the roof of your home. The roof keeps it all at bay, keeping you cool and dry inside. When it comes time to replace your roof you need to go with a long-lasting, highly durable material which can take the hot sun and wild rain. Metal is one of the best options on the market. 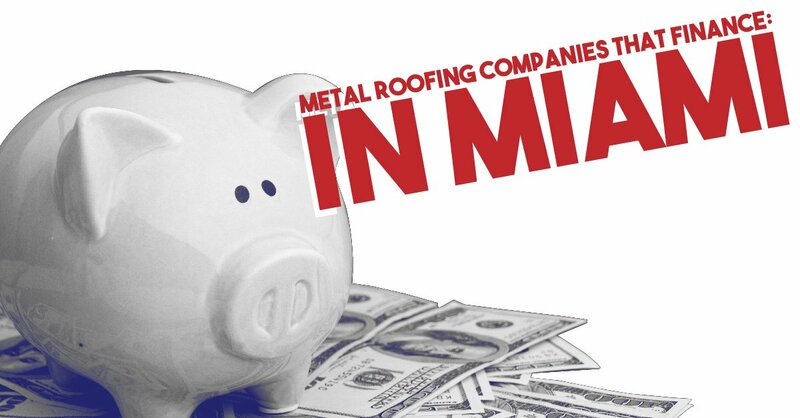 Financing from a metal roofing company can make it affordable for almost anyone. Did you know the average lifespan of an asphalt shingle roof is less than 20 years? A metal roof can last several decades. The longevity is one of the biggest advantages of having a metal roof on your Miami home. While it costs more in the short-term, the fact that it won’t need replacing lifetime makes it the most cost-effective choice. It’s highly durable and can easily withstand tropical winds and hot summer sun. It’s energy efficient, reflecting sunlight away to help keep the inside cooler. It’s fire resistant, protecting you in case a neighbor’s house goes up in flames. It requires little maintenance. An occasional wash and inspection will do the trick. Yes, metal roofs cost more than shingle ones. Financing, however, makes it affordable for many homeowners. Here at A-1 Property Services, we are proud to offer financing to help you get the roof you need now. You don’t need to scrimp when it comes to getting the roof your home needs. You can save your cash for other needs. You can pay for part of the project and finance the rest. You have the choice of doing more than simply what’s necessary. You can use the financing on your primary home, your vacation home, or your rental property. A metal roof is a true investment in your home. It will last for your lifetime and makes your home more valuable when it comes time to sell. If you want to learn more about metal roofing and finance options, contact A-1 Property Services today. We can answer any questions you might have and give you an estimate on your roofing investment.